Deferred Sales Trust – Capital gains deferral. Those who own businesses, corporations, and commercial or residential investment real estate assets are often reluctant to sell because of capital gains taxes associated with the sale. 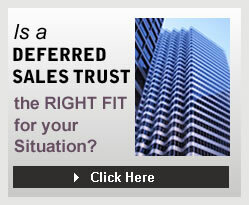 One option, less well known than a 1031 property exchange, is a Deferred Sales Trust™. A Deferred Sales Trust™ can be an excellent tool for handling the capital gains tax deficits that so many investors experience when they sell real estate assets. This capital gains tax deferral tool could save you thousands of dollars, and at the same time, provide the opportunity to potentially make a profit on the money that would have been paid to Uncle Sam in the year of the sale. The use of a Deferred Sales Trust™ is gaining popularity among those who have highly appreciated assets that are marked for sale. Click here to be redirected to a website that outlines how a Deferred Sales Trust™ works so you can discover whether a Deferred Sales Trust™ may be appropriate for your situation.